A new technique devised by researchers from North Carolina State University and the University of Calgary provides a more in-depth look at the metabolism and physiology within microbial communities – the microscopic life such as bacteria, viruses and other tiny forms of life within our bodies and throughout nature. Specifically, the new technique provides a more direct way to determine what food source, or substrate, a certain microbe has consumed. The researchers use a mass spectrometer to measure with very high accuracy the mass of molecules derived from the microbes in a community. Then they use a newly developed software program that allows them to link microbes with their substrates. The basis for connecting microbe and substrate are so-called carbon stable isotope ratios – the ratios between naturally occurring forms of carbon with different masses. Nature contains both carbon-12, the most abundant form, and carbon-13, which has one more neutron than carbon-12. Each material has a very specific ratio of these two isotopes, which essentially can be used as the fingerprint or signature of the material. The new algorithm links the carbon isotope ratios of the substrates that are available to microbes in a given environment to the ratios found in the microbes themselves. Manuel Kleiner, an NC State assistant professor in the Department of Plant and Microbial Biology and corresponding author of a paper that reports the research, says that understanding microbial communities is necessary to better comprehend animal and plant health and disease, as well as important environmental processes such as decomposition of organic matter and nutrient cycling in soils and oceans. 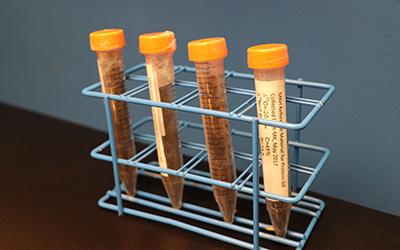 Human hair samples provide the instrument calibration standard for the new technique. Photo (and hair) courtesy of Manuel Kleiner. Human hair is crucial for the technique to work. Kleiner surprised his hairdresser by bagging his hair after a haircut. “We have to correct for a certain error occurring during mass spectrometry by using a calibration standard. As it turns out, human hair is an excellent material to calibrate our instrument,” Kleiner said. To test the new algorithm, the researchers took 20 pure culture samples and showed that the software provided measurements consistent with mass spectrometry standards. The researchers also put together complex samples with different microorganisms and tested for individual signatures from different species within the complex community. 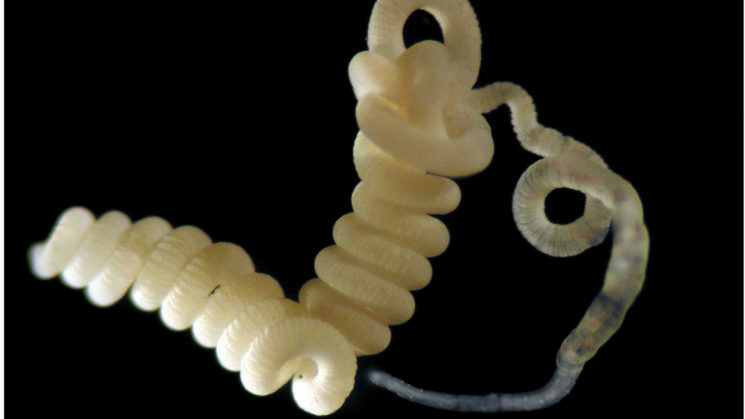 Finally, the researchers studied a gutless marine worm that hosts a number of bacteria and used the software to test the metabolism of this symbiotic relationship. Kleiner added that all the data from the study is publicly available, so other researchers can test and utilize the new software. The study appears in Proceedings of the National Academy of Sciences. Xiaoli Dong, Erin Thorson, Tjorven Hinzke and Marc Strous, all from the University of Calgary, co-authored the paper, along with Juliane Wippler from the Max Planck Institute for Marine Microbiology. The study was supported by the NC State Chancellor’s Faculty Excellence Program, the Campus Alberta Innovation Chair Program and the Canadian Foundation for Innovation. Abstract: Measurements of stable carbon isotope ratios (13C) are widely used in biology to address questions regarding food sources and metabolic pathways used by organisms. The analysis of these so-called stable isotope fingerprints (SIFs) for microbes involved in biogeochemical cycling and microbiota of plants and animals has led to major discoveries in environmental microbiology. Currently, obtaining SIFs for microbial communities is challenging as the available methods either only provide low taxonomic resolution, such as the use of lipid biomarkers, or are limited in throughput, such as nanoscale secondary ion MS imaging of single cells. Here we present “direct protein-SIF” and the Calis-p software package (https://sourceforge.net/projects/calis-p/), which enable high-throughput measurements of accurate 13C values for individual species within a microbial community. We benchmark the method using 20 pure culture microorganisms and show that the method reproducibly provides SIF values consistent with gold-standard bulk measurements performed with an isotope ratio mass spectrometer. Using mock community samples, we demonstrate that SIF values can also be obtained for individual species within a microbial community. Finally, a case study of an obligate bacteria–animal symbiosis shows that direct protein-SIF confirms previous physiological hypotheses and can provide unexpected insights into the symbionts’ metabolism. This confirms the usefulness of this approach to accurately determine 13C values for different species in microbial community samples.